Randoll Rivers is a multi-award winning Elvis Tribute Artist who began his performances in 2014. Randoll’s show is one of the most unique and professional shows around. His voice blows people away the first time they hear him sing. You can see how much he loves doing what he does by the way he interacts with the crowd and shares his stories of his journey to becoming an Elvis Tribute Artist (ETA). He truly puts his heart and soul in to every single performance. 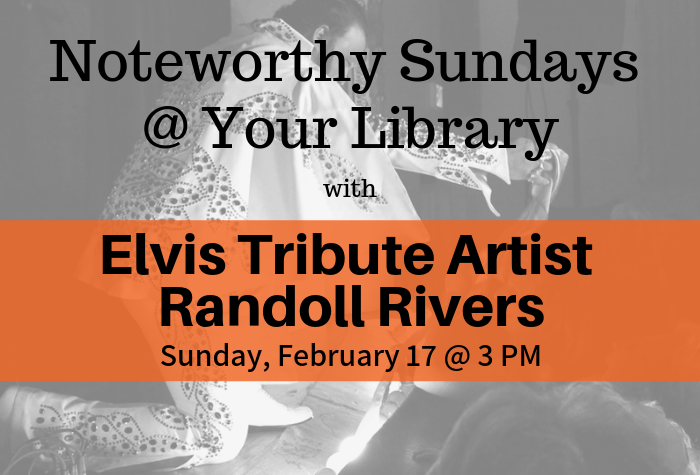 Randoll Rivers loves to bring back the memories of Elvis to his audiences. He loves to have his audience laugh and have a good time. It’s important to him that everyone has fun at every show and it is evident from his audiences’ reaction. He performs for a variety of events that range from private functions, birthdays and anniversaries, to large corporate events and fundraisers. Randoll has performed for Moose Lodges, Masonic Lodges, Elk Lodges, as well as VFWs and American Legions, which Randoll takes pride in as a former United States Marine. This concert is free for all to attend. Registration is not required, but is appreciated. For a complete list of upcoming concerts, visit the Noteworthy Sundays page here. This series is sponsored by the Friends of the Library, the City of Hagerstown, Mr. and Mrs. Lawrence J. Hoeck, the Washington County Arts Council, and Western Maryland Regional Library.